Unfortunately many evangelicals who study 1-2 Thessalonians move too quickly 4:13-5:11. This section concerns eschatology and is the primary text for the Rapture the relationship of this event to the Second coming. There is far more in this letters than “end times” and there is nothing in them that will help predict the end of the world or anything like that. Twice Paul says his purpose is to comfort the church and to encourage them to comfort one another. I believe that these books teach a “Rapture” of some kind, but I would like to find another word for it to separate my belief from the weirdness popular today. There are two other books which will be very helpful for students of 1-2 Thessalonians. Karl Donfried and Johannes Beutler edited a collection of essays on methodological issues produced by the SNTS Thessalonian Correspondence Seminar, The Thessalonians Debate (Grand Rapids, Mich.: Eerdmans, 2000). The main thrust of these essays is the current popularity of rhetorical analysis of Paul’s letters, a method which has been particularly fruitful for reading Thessalonians. There are two articles in the collection by Frank Hughes, the scholar who should be considered an early pioneer of this method. Donfried’s Paul, Thessalonians, and Early Christianity (Grand Rapids, Mich.: Eerdmans, 2002) is collection of essays from a variety of sources (journals and festschrifts) written as early as 1974. This is a very useful book since it covers many of the historical and “background” issues commentaries often treat only briefly. Abraham J. Malherbe, The Letters to the Thessalonians (New Jersey: Doubleday, 2000). Malherbe’s commentary is a detailed exegetical commentary that takes seriously forms of ancient letter writing. He presents Paul as a model letter-writer who follows the standard forms of letter writing in the Greco-Roman world. He illustrates this throughout the commentary by citing other letters that have similar rhetorical style or vocabulary to 1 Thess. His knowledge of this literature is encyclopedic, yet it is not too distracting to the reader interested in Paul’s meaning these letters. This is true even in discussion the “rapture” in 1 Thess 4:17, where he illustrates the use of the word harpazo in non-biblical Greek by Cicero and Seneca. I find his comments on this apocalyptic section excellent, since he works very hard to show how the Rapture (whatever it is) was intended as a consolation for the church, not a scare-tactic to keep the behaving properly. This is a very readable expert-level commentary, with Greek appearing in transliteration. Charles A. Wanamaker, 1 & 2 Thessalonians (NIGTC; Grand Rapids, Mich.: Eerdmans, 1996). This was a textbook for a class on Exegesis of Pauline Epistles when I was in seminary. Like Malherbe, Wanamaker makes full use of rhetoric studies to unpack Paul’s argument in the letters. He is guided by Malherbe’s earlier work on rhetoric, Malherbe’s commentary then interacts with Wanamaker’s. His seven page essay on the rhetorical analysis of the letters is a good introduction for those who are new to this approach to Paul’s letters. The body of the commentary is based on the Greek text with no transliteration and all citations are in-text. This is true for the NIGTC in general and makes for a challenging read. Like Malherbe there are numerous comparisons to other Greco-Roman letters, although Wanamaker does not quote them at length. F. F. Bruce, 1 & 2 Thessalonians (WBC; Nashville: Thomas Nelson, 1982). It seems strange to say that this commentary is now thirty years old! Bruce is always worth reading, and this early entry in the Word series is an exceptional commentary on the Greek text of the Thessalonian letters. Bruce is an efficient exegete. He comments on the Greek text of these letters briefly yet there is always a depth of understanding. Since Bruce wrote before the explosion of rhetorical studies on Thessalonians, the commentary itself is not concerned with “forms” or style of argument. A particular highlight of this commentary is Bruce’s nine-page excursus on the Antichrist in the context of his commentary on 2 Thess 2:1-12. Leon Morris, 1 and 2 Thessalonians, Revised Edition (NICNT; Grand Rapids, Mich.: 1991); 1 and 2 Thessalonians, Revised Edition (Tyndale; Downers Grove, Ill.: InterVarsity, 1984); 1 and 2 Thessalonians (Word Biblical Themes; Dallas: Word, 1989). I suppose this should count as cheating on my own rule of “only Five Commentaries,” but all three of these books are from Morris are worth reading. The Tyndale commentary is a revision of Morris’s 1956 commentary in the Tyndale series. Morris covers both books in a mere 152 pages, but does a good job highlighting what is important for reading and understanding the text of these letters. The commentary is based on the English text with Greek appearing in transliteration. The NICNT is also a revision of an earlier volume from the early 1960s. This is definitely the “first off the shelf” commentary. The newer commentary updates the bibliography and interacts with Ernest Best’s work on Thessalonians. The main body of the commentary is based on the English text, Greek and other details are in the notes. It is also worth seeking out Morris’s contribution to the Word Biblical Themes series written in 1989. This is little book is a biblical theology, drawing out several key themes of importance in the letters. I find his comments on the eschatology of 1-2 Thessalonians refreshing, and judging from the underlining in my copy of the book, I have stolen learned a great deal from Morris. Greg Beale, 1-2 Thessalonians (Downers Grove, Ill.: InterVarsity, 2003). This commentary is in the IVP New Testament Commentary series and is intended for pastors and teachers. The body of the commentary is based on the English, with occasional key Greek words appearing in transliteration. All citations are in-text; he interacts with a range of scholarship although it is weighted towards evangelical commentators. Beale treats more technical details in a footnote-like section at the bottom of the page. With respect to eschatology, Beale has a chart summarizing his belief that Paul is commenting on the Olivet Discourse (Matt 24) in his eschatological section (p. 137). Conclusion. I cheated a bit on this one by including three by Morris and adding the Donfried books in the introduction. But I did leave off a few very handy commentaries to at appear to obey my own rules – what did I miss? Let me know what you have found useful in your preaching and teaching. Introduction. 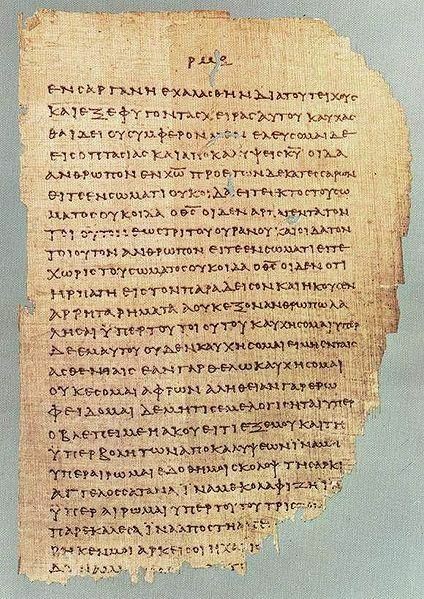 The letter to the church at Colossae is one of the lesser-studied books in the Pauline letters. Because it is quite short it can be overshadowed by Romans or 1-2 Corinthians, yet the book has a great deal of theological depth, especially as Paul presents Jesus in the first chapter. A major concern of most commentaries on the book is the Christology. Some find it too advanced and therefore date the book to a later writer within the Pauline circle (similar to Ephesians). This is not necessary, however, since Paul’s view of Christ in Col 1 is quite similar to that of Philippians 2:5-11. Another unique feature in Colossians is the identity of the “opponent.” Clearly Paul has some false teaching in mind in the second chapter, but there is a wide range of views as to the identity of these agitators. Clint Arnold wrote a monograph on the topic and there are many articles attempting to describe this early defective view. See Arnold’s The Colossian Syncretism: The Interface Between Christianity and Folk Belief at Colossae (Grand Rapids, Mich.: Baker, 1996). Colossians Commentaries are often combined with Philemon since the two letters are related. Unfortunately this means that the brief note to Philemon gets tagged to the end of a larger commentary like an appendix and is not given the full treatment it deserves. It also bothers me that I cannot sort my books in canonical order, but that might just be me. James Dunn, Colossians and Philemon (NIGTC; Grand Rapids, Mich.: Eerdmans, 1996). Dunn is always interesting to read and the New International Greek Text series is always excellent. Based on the theology of the book, Dunn thinks that the book was not written by Paul, even if it is “Pauline.” The issue of authorship is not as critical an issue as for other books, Dunn refers to the writer as Paul despite expressing doubts that he was the actual author. He is warm to the possibility that the book was written from a hypothetical Ephesian imprisonment, but cannot state this (or any alternative view) with certainty. The opponents addressed by the letter are from the local Jewish synagogue. As Dunn says, to call this a “heresy” is “quite inappropriate” since the “competing philosophy” does not come from within the church. The body of the commentary is based wholly on the Greek text, with detailed lexical and syntactical comments. Dunn is well-versed in Second Temple Period Jewish literature as well as Greco-Roman works and integrates this material into his commentary well. In particular, material from the Dead Sea Scrolls is used to illustrate the “Jewishness” of Paul’s opponents. Douglas Moo, Colossians and Philemon (PNTC; Grand Rapids, Mich.: Eerdmans, 2008). Moo’s commentary is fairly traditional with respect to introductory matters (Paul wrote the letter during his Roman imprisonment). He deals with objections to Paul as the author, primarily perceived differences in theology when Colossians is compared with Romans, Corinthians and Galatians. The main problem with non-Pauline authorship, for Moo, is that he is not comfortable with pseudepigraphical authorship. It would be quite remarkable that the author would prohibit lying in 3:9 then claim to be Paul! With respect to the opponent, Moo engages Dunn’s arguments that Paul has a “standard Judaism” in mind. The fact that Colossians lacks the sort of engagement of the Hebrew Bible found in Galatians is a good argument that the opponents are not Judaizers in the Galatians-sense of the word. Moo prefers to see a kind of syncretic philosophy behind the opponents, mixing Judaism and mysticism. The body of the commentary is based on the English text (various translations are compared), Greek words appear transliterated. Moo engages a wide range of scholarship, including Dunn and Wright. The result is a very useful commentary for a pastor or teacher preparing to present Colossians to their congregations. Peter T. O’Brien, Colossians, Philemon (WBC; Dallas: Word, 1982). O’Brien’s introduction has one of the more detailed survey’s f the “Colossian Heresy,” but since he writes before Wright and Dunn, his section on Judaism as the source of the problem is light. In the end, he sees a Jewish / mystical syncretism as the problem Paul addresses in the letter. With respect to authorship, O’Brien is not particularly dogmatic. While he rejects most of the non-Pauline arguments, he is aware of the problems associated with Paul as the author. He is happy enough to consider the letter authentic, even if Paul was the source and someone else (Timothy) was the author. The body of the commentary is based on the Greek text, all sources are cited in-text (with frequent references to TDNT for lexical studies). As with all the Word series, the bibliography at the head of each section is invaluable, although now twenty years out of date. I would love to see this excellent commentary updated along the lines of Martin’s update to Hawthorne’s Philippians WBC commentary. N. T. Wright, Colossians and Philemon (TNTC; Grand Rapids, Mich.: Eerdmans, 1986; now published by Intervarsity, 2008). The Tyndale series has been around for many years, Wright’s little commentary replaces 1960 Tyndale commentary by Herbert Carson. At only 192 pages, Wright’s commentary is brief, yet extremely helpful. The style is stimulating to read and will be helpful for any pastor or teaching preparing a sermon on Colossians. As expected, Wright has a fairly unique view of the Colossian heresy. He thinks that Paul is writing against the same sort of Judaizers he encountered in Galatia, considering Judaism as if it was just another philosophy in the marketplace of ideas of first-century Colossae. (This approach is similar to Dunn’s, Wright’s commentary pre-dates Dunn by a decade). This observation allows Wright to read the letter with the lens of the New Perspective on Paul (pages 24-30 make this point clear). As the commentary progresses, Wright consistently highlight’s Paul’s polemic against Judaism, as opposed to other suggested sources. The commentary is on the English text with occasional Greek appearing in transliteration. There is awareness of other scholarship, but the style of the commentary limits interaction with other commentaries. Brian J. Walsh and Sylvia C. Keesmaat, Colossians Remixed: Subverting the Empire (Downers Grove, Ill.: InterVarsity, 2004). This is an unusual book, and I was initially hesitant to include it in a list of commentaries. It is an important book to me since this book was the first evangelical post-modern commentary I encountered. In fact, I am not sure I want to call it a commentary in the traditional sense of the word. As the authors imply by the title, they are “remixing” the letter in order to present it to 21st century America. As such, this is part sermon, part commentary, and part prophetic indictment. I recommend a careful study of Colossians, then reading this book from cover to cover – you will be challenged! Conclusion. Dunn’s commentary is my first choice, but there are others which are worthy of attention. I have not spent sufficient time with Eduard Lohse’s commentary in the Hermenia series. The same is true of Jerry Sumney’s recent volume in the New Testament Library. I like Charles Talbert’s volume in the Paidia series as well. So, what have I missed? What “classic” would you add to this list? There is no description of the actual crucifixion in John’s gospel. John simply states that “they crucified Jesus” along with two others. In fact, there is no description of crucifixion in any of the four gospels! This stands in contrast to most modern presentations of crucifixion, which seem intent on the gory details. Mel Gibson’s Passion of the Christ is a prime example of using shock and gore in depicting Jesus’ execution. 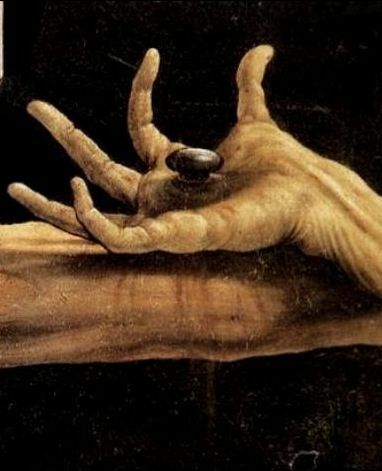 I find it rather disturbing when well-meaning Christians attempt to following their Lord by hammering nails into their flesh. This totally misses the point of the crucifixion and alienates people who do not understand the point of such self-mutilations. The gospel writers were more interested in why Jesus died, rather than how the Romans tortured him. Crucifixion was not invented by the Romans, but they perfected it as a method of execution for rebels against the empire. They called it the “extreme penalty” or “the humiliation.” It was typically reserved for the lower classes, especially conquered peoples. The Romans considered crucifixion too degrading for a Roman citizen, so it was only used to punish citizens who had committed treason or fled in battle. This sadistic death was the death that Jesus endured. He voluntarily submitted to a death on a cross, and all of the beatings and insults that were a part of the process. He went willingly because he knew that by his death he might bring life into the world. The Jews knew well the punishment of crucifixion. Jews who resisted Antiochus IV Epiphanies (167-164 B.C.) were crucified (Antiq. 12.5.4). Alexander Janneus, the Hasmonean high priest, executed 800 political opponents (many were likely pharisees, Antiq. 13.14.2). In 4 B.C. the Roman general Varus lined the road from Sepphoris to Galilee with 2000 crucified Jewish rebels (War 2.5.2, Antiq. 17.10.10). A bit later in the first century the procurator Tiberius Alexander (A.D. 46-48) crucified the sons of Judas the Galilean (Antiq. 20.5.2). That Jesus was crucified would have been offensive to Jew and Gentile. If the leader of one’s religion executed in this way, it would seem to be proof that your religion was flawed! The Romans considered talk of a cross to be impolite. One did not describe the process or talk about the details. Since death by crucifixion was intentionally sadistic and cruel, it was simply not a appropriate topic for conversation. It was an extreme punishment meant to keep conquered people in their place. To the Jew, anyone killed by crucifixion was under the curse. The Old Testament said that anything that was hung on a tree was cursed (Deut 21:22-23). It was the ultimate insult to the Jew of the first century to be told that not only did the Messiah come and they did not recognize him, but that he had been crucified as a common criminal. Christianity was blasphemy to the Jew. To the Greek, the death of Jesus on the cross was foolishness. It was strange to think that the true God of the universe might take human form, but it was folly to think that when he did take human form, he was killed. And worse, he allowed himself to be killed! Christianity is a strange religion in that it worships a God who willingly sacrificed himself. I think that the Cross must be central to Christian preaching, but we must follow the Gospels and emphasize why Jesus died, not how. The scandal of the cross is not the violence of the act, but the subversiveness of God making the ultimate sacrifice to atone for sin. Yesterday I noticed that Logos was downloading resources, which it does from time to time. When it finished, I noticed the Faithlife Study Bible had been added to my library. I had not remembered ordering the resource, but later than day I received an email from Logos announcing the “next big thing.” This “big thing” is a Study Bible created by Logos. It really cannot be described as a book, since it is a running commentary on the Bible which expands to fit the user’s needs and interests. It uses the Bible you already own and read in Logos, but adds brief commentary and links to articles which a traditional paper Study Bible cannot provide. 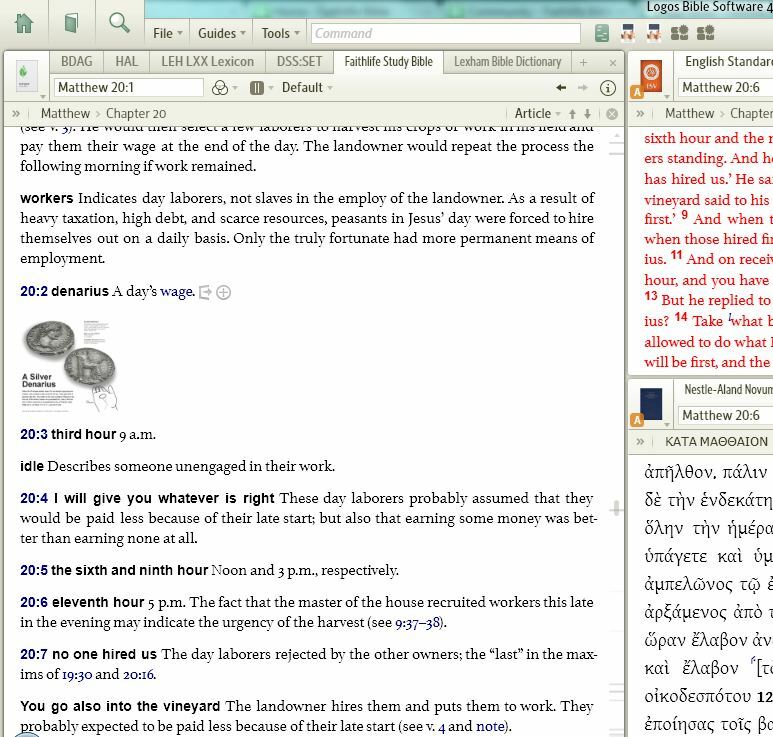 Key words are linked to the Lexham Bible Dictionary, Logos’s own Bible dictionary and occasionally there are links to “infographics.” For example, I happened to be working in Matthew 20, the Parable of the Workers. For verse 9 there was a brief line of commentary, with the word “wage” as a highlighted link. The link opened the Lexham Bible Dictionary entry for Coinage in Biblical Times, an impressive article by Anthony Meyer which could have been an entry in the Anchor Bible Dictionary or the new Eerdmans ISBE. It was well-written and had a significant bibliography. The Faithlife Study Bible also contains timelines at key places in the text. These are very stylish, although sometimes the characters look a bit like the old Good News for Modern Man illustrations. (Younger users will not make this association!) There are links to “tables,” such as a list of Jesus’ parables. Occasionally there an icon that looks like a paper, clicking this takes you to Sidebars. Like any Study Bible, there are a number of longer notes on topics, themes, contextual studies (words, history, people, etc) as well as devotionals. These entries are all signed by the author and all seem to be no more than a “page” if printed in a traditional Bible. Like the ESV Study Bible, there is a significant amount of “extra” material here, such as “How to Study the Bible,” written by Doug Stuart (who wrote the book by the same name). I noticed a devotional by Charles Stanley and the devotional on Church was by Jim Samra. 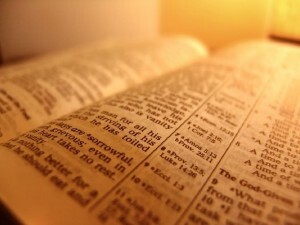 There are a number of other “big” names in the Bible, so the reader can be assured that the notes are quality. The real advantage to publishing a book this way is that it can be updated and expanded constantly. I assume that Logos will develop this tool the same way that they did the Lexham Bible Dictionary and allow authors to update their entries and add new ones. This is sort of a limited wiki approach which allows changes, but only through approved authors and with editorial oversight. If this happens, then it really would be the “next big thing” in publishing. The Faithlife Study Bible is a free resource for the Logos Library, but also a free app for iPad (iOS devices) and Android. There is a native iPad and iPhone app in the App Store for the Faithlife Study Bible. I spent a little time with the iPad version this morning and found that it was a very useful tool. It appears to use the same basic shell as the Logos App (or the Vyrso App), with the Bible in the upper third of the scree, the commentary in the lower two-thirds. Swiping left or right turns the pages, the windows are linked so they will both move when you advance either the Bible or the Commentary. The bottom line is that Logos has provided an excellent tool for a layperson with the Faithlife Study Bible. It is free for every platform, so there is little reason not to try it out! Introduction. The short book of Philippians is a favorite for many Christians. The book contains one of the most important theological texts in the New Testament, the Christ-Hymn in Phil 2:5-11. Exegesis of this incredible piece of theological worship ought to be central to any commentary on Philippians. Ralph Martin wrote a monograph on this text which surveys recent interpretation of the song and is longer than most commentaries on the whole book (A Hymn of Christ, Downers Grove, Ill.: Intervarstiy, 1983, 1997). 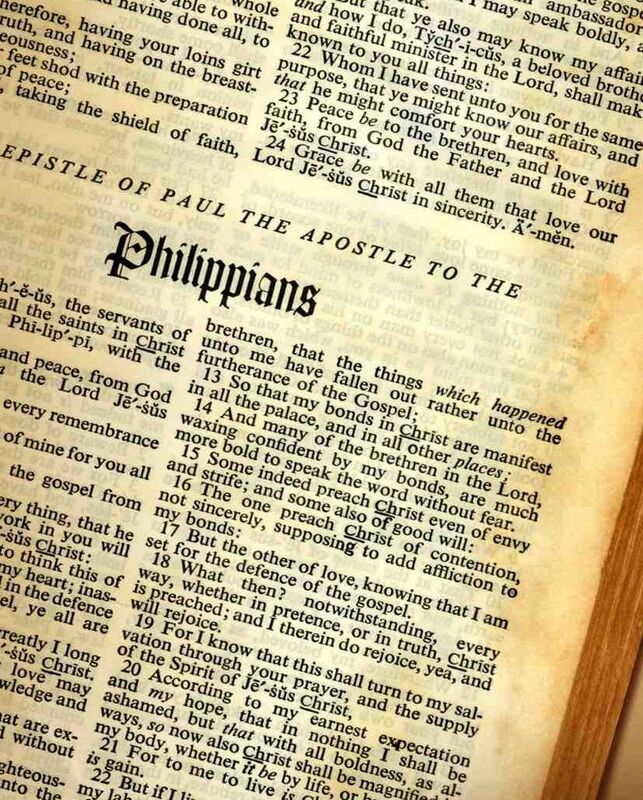 Commentaries on Philippians usually deal with the suggestion that the letter combines two (or more) shorter letters. There is a rough transition after 3:1, from warm and friendly to a rather strong polemic against Judaizers. There are many suggested solutions to the problem, usually suggesting some sort of interpolation of one or more shorter letters in the book. Just who these opponents are is an issue related to the date of the book. If the letter comes from an earlier point in Paul’s career rather than from Roman imprisonment, then the opponents may be the same people targeted by Galatians. Peter T. O’Brien, Philippians (NIGTC; Grand Rapids, Mich.: Eerdmans, 1991). Like most of the New International Greek Text Commentary, O’Brien’s contribution on Philippians is excellent and well worth the price. He finds interpolation theories lacking, causing more problems than they solve. The book was written by Paul during the Roman imprisonment to thank the church for their support and to warn them against Judaizing false teachers. He proceeds through the Greek text of Philippians phrase-by-phrase without transliteration, making both syntactical and lexical comments. He integrates into the body of the commentary theological observations as he interacts with a wide range of contemporary Pauline scholarship. He includes three short excursuses on the Christ Hymn (which he oddly called appendices). His comments on the phrase “taking the form of a servant” and Isaiah 53:12 are judicious, ultimately rejecting a certain connection between the two texts. Gerald F. Hawthorne and Ralph P. Martin, Philippians. Revised and Expanded (WBC; Dallas: Word, 2004). Ralph Martin updated the original WBC volume on Philippians by adding to the bibliographies and expanding the explanations at the end of pericopes. Martin is the New Testament editor for the series and has written an excellent monograph on the Christ Hymn, as well as a short commentary on Philippians in the New Century series (Eerdmans, 1976). In fact, this section is where the commentary excels. The bibliography is extensive (up to 2003), the comments on the structure of the hymn are detailed and interact well with contemporary rhetorical studies of the hymn. The comments proceed almost word-by-word through this section since virtually every word has theological importance. There is a brief “review” after the main commentary on 2:5-11 summarizing the exegesis of the six verses. Moisés Silva, Philippians. Second Edition. (BENTC; Grand Rapids, Mich.: Baker, 2005). Silva’s commentary was one of the earliest in the Baker series, originally a reprint of the 1988 Wycliffe Exegetical Commentary. The second edition adds two sections to the introduction (“Literary Structure” and “Exegetical History”) and the footnotes are expanded to include scholarship since the first edition was printed. The commentary proceeds phrase-by-phrase, with Greek appearing along with transliteration. Text critical notes are included in “additional comments,” which strike me as longer than in other volumes of this series. In fact, at times these notes look more like a Greek-Text commentary than the main body of the work! Gordon D. Fee, Philippians. (IVP New Testament Commentary; Downers Grove, Ill.: InterVarsity, 1999). This is the first volume from this series I have included thus far, although it is not because others in the series are weak. For the most part, this commentary is more brief than the others and perhaps for that reason more accessible for the layman or busy pastor. What sets this commentary apart is Fee’s use of the Greco-Roman ideal of friendship as a model for understanding the letter. In this he follows closely the work of Stanley K. Stowers (“Friends and Enemies in the Politics of Heaven” in Pauline Theology edited by J. M. Bassler [Minneapolis: Fortress, 1991]), 105-121 and Ben Witherington, III (Friendship and Finances in Philippi [Trinity, 1994]). The body of the commentary is based on the English text, Greek appears only in transliteration, with only light comments on syntax only when necessary. Fee interacts with other scholars, but for the most part these are his observations on the text. This makes for a very readable commentary which will be quite useful for sermon preparation. Conclusion. Other commentaries ought to be included I am sure, but I have limited myself to five for this series – what are your favorites? What “classic” should be on every pastor or scholar’s shelf? Moule perhaps? Introduction. Ephesians is a small book which makes a very large contribution to Pauline Theology. Yet one of the first problems one encounters with commentaries on Ephesians is a discussion of authorship. For many contemporary scholars, Ephesians is post-Pauline, perhaps written as a summary of Paul’s theology by a disciple of Paul. This unknown disciple may (or may not) have been authorized by Paul to write the letter. Commentaries on Ephesians often have lengthy, complicated surveys of the various options for authorship before settling on either the traditional view that Paul wrote the letter or some form of pseudonymity. While I do not use Pauline authorship as a litmus-test for a good commentary on Ephesians, it is interesting that three of my choices support the traditional authorship, two do not. Hoehner observes that the scholarship is fairly evenly divided on the issue, although some prefer to remain agnostic on the issue. Others have changed their views over the years, in Lincoln’s case from Pauline authorship to non-Pauline. Sometimes commentary series will include Ephesians with the other Prison Epistles, usually Colossians, in a single volume. The parallels between Ephesians and Colossians make this a convenient combination. This obviously reduces exegetical details, but also obscures the unique contribution of the letter to the Ephesians. I have given preference to single-volumes on Ephesians here, but there are a few combined commentaries which are also good. Brevity is not necessarily a bad thing in a commentary. Harold Hoehner. Ephesians (Grand Rapids, Mich.: Baker, 2002). Hohner’s commentary on Ephesians is magisterial, demonstrating a mastery of the massive secondary literature on Ephesians. At 930 pages, this is the one of the most detailed modern commentaries on Ephesians available. His detailed examination of the Greek text is excellent, yet not overly technical. He steps through the text of the book phrase-by-phrase, with the Greek text provided without transliteration. He makes occasional text-critical observations in footnotes. The commentary has 130 pages of introduction, half of which concerns authorship (including 16 pages of bibliography on authorship alone!) This includes a chart with virtually every major commentary on Ephesians and New Testament introduction indicating whether they are for or against Pauline authorship (up to 2001). He supplements the commentary with a number of excursuses on technical details, particularly good are his comments on “Mystery” (pages 42–34) and “Slavery” (pages 800-4). Both include extensive bibliographies in the notes. Ernest Best, Ephesians (ICC; T&T Clark, 2004). Best’s commentary on Ephesians is an excellent replacement to the classic ICC volume by T. K. Abbot (Ephesians and Colossians, available free at Google Books). Best is more or less agnostic on authorship, called the author AE (author of Ephesians). This exegetical comments on the Greek text are excellent, perhaps the best example of how a Greek text commentary ought to work. Best does not stop at reading the Greek, however, his comments draw out implications for the theology of the letter. T&T Clark published a Shorter Commentary on Ephesians which reduces the exegetical detail, this version of the commentary would be more helpful for the busy pastor. Frank Thielman, Ephesians (BENTC; Grand Rapids, Mich.: Baker, 2010). Thielman is well-known for his book Paul and the Law and a New Testament theology from Zondervan, but this is his first exegetical commentary. He deals with the problem of authorship in only a few pages, finding pseudonymity too unusual in the early Christian community to be a viable option. The commentary follows the user-friendly design of the Baker series, offering exegetical comments on the Greek text with transliteration. Compared to other volumes in the BENTC, Thielman’s commentary has more syntactical detail. I particularly appreciate his use of Greco-Roman sources, especially in the “Household Code” section of the letter. A. T. Lincoln, Ephesians (WBC; Dallas: Word, 1990). It is perhaps strange to say, but this commentary is the ‘classic” on this list. Lincoln thinks that Ephesians is a reinterpretation of Colossians (page lv), but also that Ephesians draws on other authentic letters of Paul (page lvi). The book was written by a follower of Paul who attempted to summarize Pauline theology for his generation. His assumptions are worked out in the commentary. In his comments on Eph 2:11-22, for example, he points out several parallels to Colossians and argues that Ephesians is an expansion or commentary on the earlier (Pauline) material. This kind of argument is found in the “Form / Structure / Setting” sections standard to the WBC series. The exegesis sections are structured by longer phrases and is not overly technical in matters of syntax. That sort of material is found in the notes on the translation of each pericope. What is most helpful is Lincoln’s frequent comments on the use of the LXX or Hebrew Bible as foundational for understanding the text. Peter T. O’Brien, Ephesians (PNTC; Grand Rapids, Mich.: Eerdmans, 1999). O’Brien has written major commentaries on each of the Prison Epistles for different series (NIGTC, WBC) and has contributed much to the study of Paul in recent years. His introduction to Ephesians is more brief than others on this list, but it is quite efficient. He defends a traditional view of Pauline authorship, pointing out that the problems created by pseudonymity are quite difficult, perhaps more so than the problems associated with Pauline authorship. The body of the commentary is based on the English text with Greek commentary relegated to the footnotes, as is the style of the Pillar series. This makes for a readable commentary which will be very helpful for the busy pastor or student preparing to preach the text of Ephesians. Conclusion. Once again, there are a few good commentaries I was forced to omit to keep it to five. This give you (the reader) a chance to let me know what you have found useful in your preaching and teaching. I left off Clint Arnold’s commentary (Zondervan Exegetical Commentary on the New Testament) simply because I have not used it yet (see Nijay Gupta’s comments here). This list is “light” in the New Perspective on Paul (is there anything reflecting that view on Ephesians? ), and the oldest commentary I list is from 1990 – what “classic” should the student of Ephesians have on their shelf? 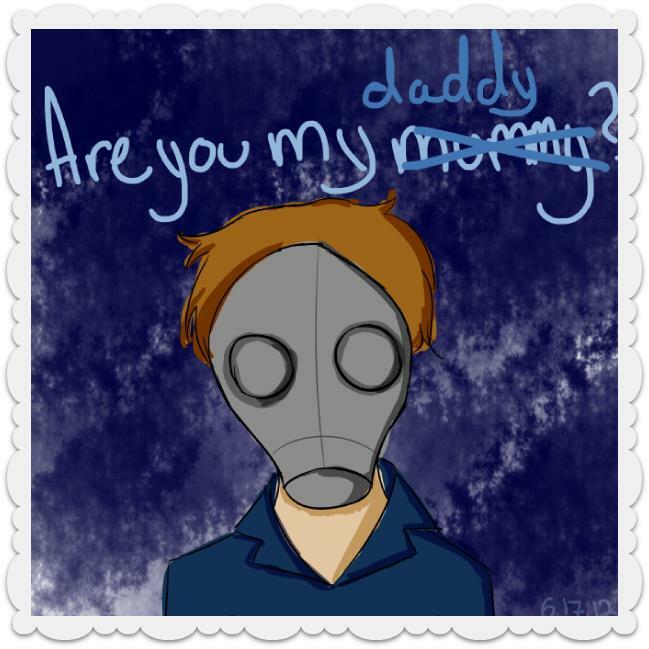 I appear to have raised the kid right….